You are here: Home / Columns / Fishin' / Taking on a Killer! One of my personal goals every year is to catch a new species of fish. While I have managed to land a fair variety in my time, I still have a pretty large bucket list of scaly critters that need my attention! This summer, I had targeted a long, slender assassin, the pike! I’ve wanted to fish for one of these toothy ambushers for a long time. I can remember my Grandpa, back in the fifties, telling me about his battles with the northern pike up in the lakes of his native Wisconsin. He had a box full of scratched up lures dedicated to just that fishery. Looking at those chewed up bits of metal and wood got me fired up! I really enjoyed our catfish, perch and trout, but here was something to sink your teeth into, or maybe something that would sink theirs into you! 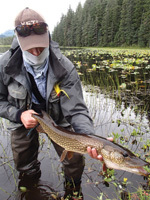 Ask anyone who has fished for pike and they’ll tell you about the vicious strikes, exploding waters and near misses that make your heart stop. As you hop your lure though the foliage on the lakes, the lily pads part, the water swells and then, water flies everywhere as the big snake-like fish pounds your lure. What could be more fun than that! 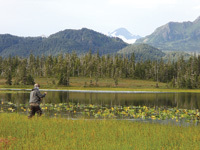 When my group of buddies decided to take a trip up to Yakutat, Alaska, for our summer adventure, one of my first contacts was Bob Miller, owner of a fly-fishing shop up there. During our conversations, I inquired about anything unusual we might throw a fly at! Bob was most enthusiastic about a fish that was hanging out in some of the little lakes just east of town. It seems that somehow, in the big game of genetics, a rather unique species evolved in their area. A few of the local waters boasted very fishable populations of a pike species found only locally and in a few lakes in Siberia! I guess it was somewhat different than the northern pike, a species much despised in many of the salmon-rich waters. But, since this species had the good sense to exist only in its enclosed watersheds, it was tolerated; indeed the species was protected from harvest. This was not a problem for my buddies. We had ice chests full of salmon, halibut and lingcod and would be very happy to catch and release a few pike. 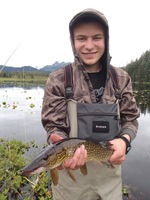 Like most of our group, I’d never even seen a pike before, so we put it on our agenda for our last day in Alaska! When we arrived at Yakutat, we made it a point to drop by Bob’s shop, located in a huge old airplane hangar he’s working to restore, and bulked up on supplies for our fishing. In addition to local patterns for salmon, we went through his collection of pike flies. Talk about cute! The fish may be nasty looking and vicious, but the flies are adorable! Designed to imitate local pike food, they are various patterns of mice, frogs, and other “floaty” handfuls that would land high on the surface and make irresistible wakes to attract the big fish’s attention! We also got an aerial photo of the lake. While it was not very far from the only road out of town, the lake was a bit tricky to find. In Bob’s blog of fishing activity, I found a great account of a couple of would be “Pikers” who spent an hour crashing through the willows, only to give up and escape before they were eaten by the bears they figured were waiting for them in the deep foliage! They never got a glimpse of the lake, let alone got to cast for the monsters under the lily pads! Our last morning in Yakutat, my son Steve and I, along with fly-fishing buddies Walt Weber and Tom Scoggins, packed up our cute flies and headed out to the lake. We found the parking area and tried to get compasses situated (no GPS available!) and headed out into the swampy terrain. In about half an hour, we found ourselves deep in willows, and I was flashing back on the terrors written in Bob’s blog!! Luckily, in addition to us old folks, son Steven was with us. With the energy and tenacity of youth, he blasted through the hostile terrain and we heard the most welcome shout, “I see the lake, head toward my voice!” This was especially welcome since the direction of the hailing was not one we would have selected! A few minutes of brush crawling and we could see the pretty waters of a lovely little lake. Flanked by a picturesque mountain background, the lake seemed to feature a bunch of good greenery suitable for an ambush species. As we approached, the meadow dissolved into a strange sort of marine grassland, covered by about six inches of water. It looked like a meadow, but was floating in a few inches of the wet stuff. As I neared the lake, the grass started moving as mysterious wakes moved into the deeper waters. Reaching the edge of the actual lake, I put on a frog imitation, and cast to a few feet of open water between the floating meadow and the lily pads on the lake. On my second cast, something rose and splashed, pulling my frog under. I set the hook hard, but had no results other than having my frog jump out of the water and into the air! I made several more casts, each of which brought a huge swirl from the deeper water, a drowning of my fly, and no fish when I struck. Finally, I decided to give the fish a bit more time, counted to five before I did anything, and then tried to drive the hook home. To my delight, a big brown monster flew to the surface! After a bit of a battle with fish and lily pads, I managed to guide the fish through the sunken meadow at my feet. The pike was a pretty brown with lots of yellow slashes and a light belly. He was a bit over two feet long, maybe three pounds, and had a pointy mouth with lots of very sharp teeth. The guys came around to view my prize catch, Steve took a picture, and then we spread out and tried to hook a few more. It was a strange morning. The fish rose readily to strike, and it was great to see the water boiling around the fly, but we managed to hook very few. A later conversation with Bob at the fly shop led us to believe that maybe the line used to make the flies weedless was a bit stiff, so the hook had trouble penetrating, and the light flies often went airborne when struck by the starving fish below. But the great action and the chance to catch something very different made up for the small number of fish actually landed and released. With the difficulty of getting the hooks out of the maw of sharp teeth, that might have been a blessing in disguise! We had the fun of attracting and observing the big fish in action, and were able to add another fish to our list of lifetime catches! But there was some biting going on that had a very real impact! Shortly after we left the pike waters for another great afternoon of sockeye fishing, Walt and I noticed that our hands seemed a bit swollen. By the time we sat down for dinner that night, we looked like we were wearing baseball gloves on our hands! During our time at the lake, we had been chomped by a local species of fly known as “white sox.” While their bite was gentle, the results were anything but. In addition to our hands being swollen, the bite marks that soon turned red were sore for days. When I asked Bob Miller for some good pike photos for illustration, I noticed that he and his son were pretty much covered head to toe when they went to the lake! It would have been nice to have had a heads up on that one! But bug bites aside, I’d make the pike trip a must anytime we get to return to Yakutat! The pike were beautiful in their own way, and the sight of the water boiling as the big “wolves of the lake” charged after a fly was something I’ll remember for a very long time!